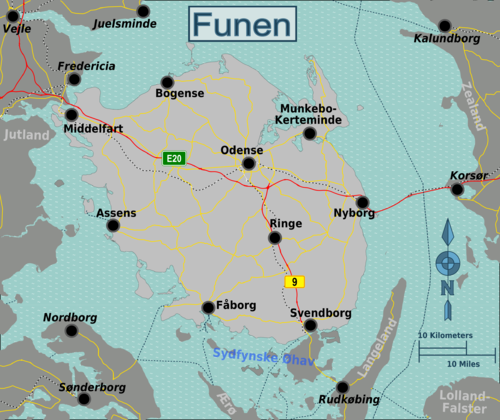 Funen is in Funen and Surrounding Islands. Funen is very much the island in the middle between Zealand and Jutland. Mockingly it is said that Funen only exists to carry the highway between Copenhagen and Aarhus, while the locals on the other hand claim to harbour the best traits of both Jutland and Copenhagen. Funen is a place for good life and is generally easy going. You can easily find good food at reasonable prices, and good humour is everywhere. Funen however has one unrivalled claim to fame: Odense, the main city on Funen, is the birthplace of world famous writer Hans Christian Andersen. This page was last edited on 30 September 2016, at 16:40.